My favorite pond for photographing Green Frogs is in fact an old part of an ATV trail that is now filled with water. 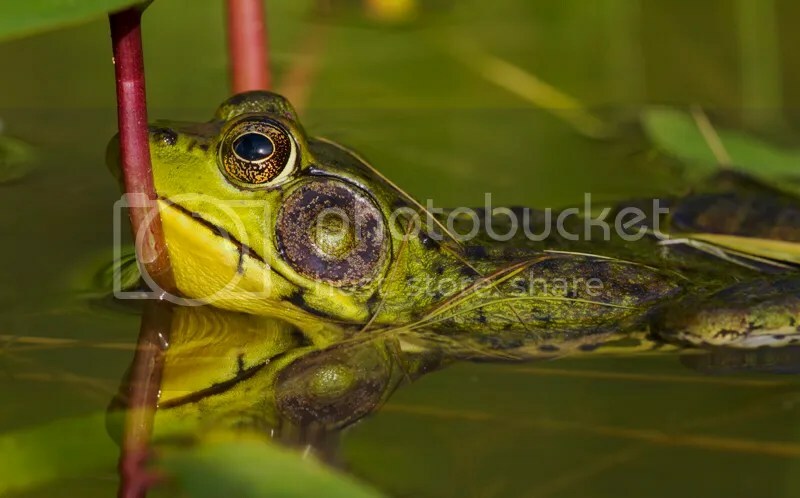 The pond is not wide so it’s easy to take photos of any Frog in the water or on the shore . When i can i stop at the pond before going to work, i don’t always take photos or came home with a good shot but the more i go the more i have chances to get a good shot. This is a big advantage to have a place like this that you can go often and try new technic are POF, if it doesn’t work the first time you can easily try again and again until you get what you want. 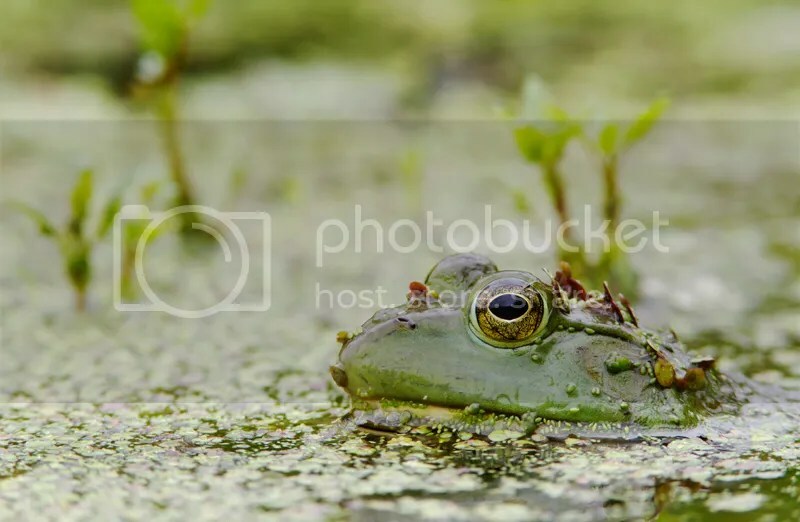 During the last years i got different perspective of Frogs at that pond by using different lenses. I will start by a short video i made this morning of the pond and the set-up i used to get the following photo. 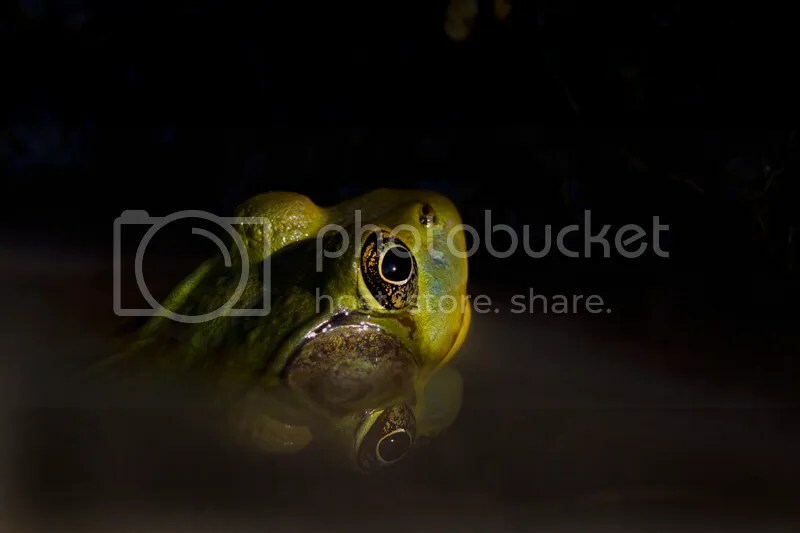 This is the photo of the Male Green Frog that i’m showing in the following Video. 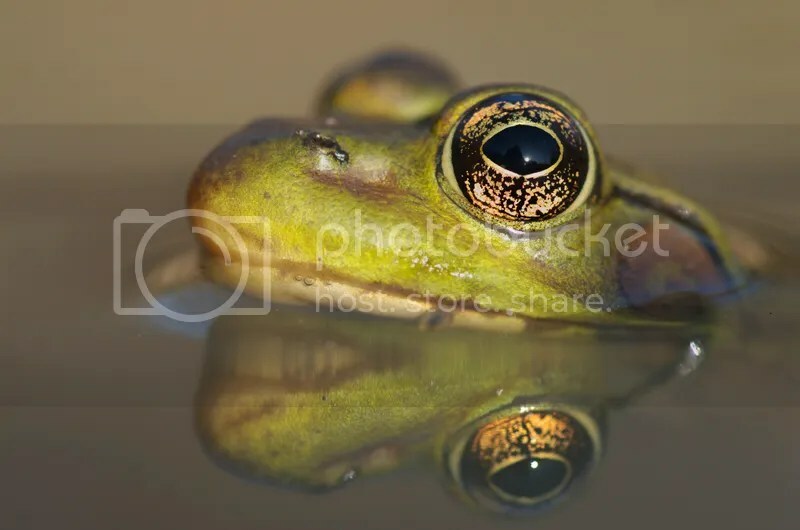 unfortunately i couldn’t get the reflection of the Frog’s eye on the water because of the reflections of the plants surrounding the frog. Canon 7D, 400mm/5.6L, 52mm of Ext. tubes, ISO 400 at f/9, tripod, LV was used to focus precisely on the eye. 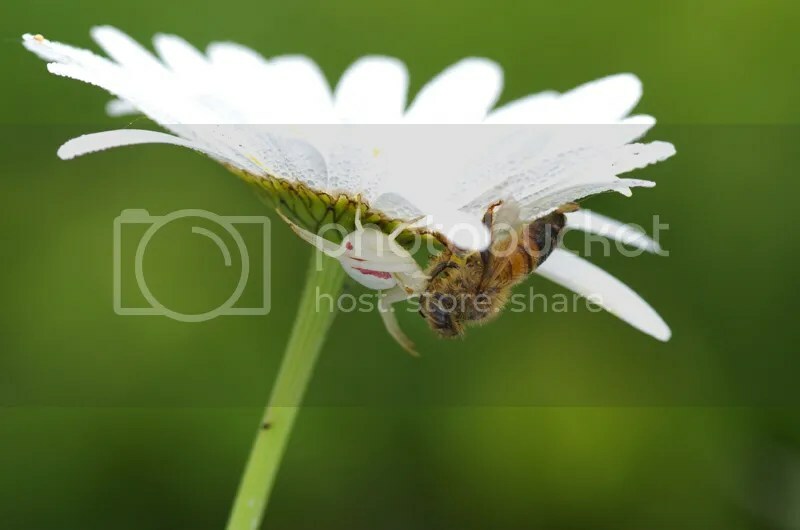 Some more shots from that pond and i always keep an eye for insects on plants along the shore. Canon 7D with EF 70-300mm IS at 300mm with Ext. tube, at f/11, tripod. Pentax K-01 with DFA100mm Macro WR, ISO 800 at f/7.1, tripod. Pentax K-01 with DFA100mm Mcro WR, ISO 500, 1/500 sec.at f/5.0, handheld with SR. Rain protection for lenses and your Cards. Back in March 2013 when i bought a Canon 7D and a 400mm/5.6L i knew that this combo was not as weather sealed as my Pentax K20D and DA*50-135mm and i didn’t want to use plastic bags like i did with my Pentax-67 M*400mm/4. 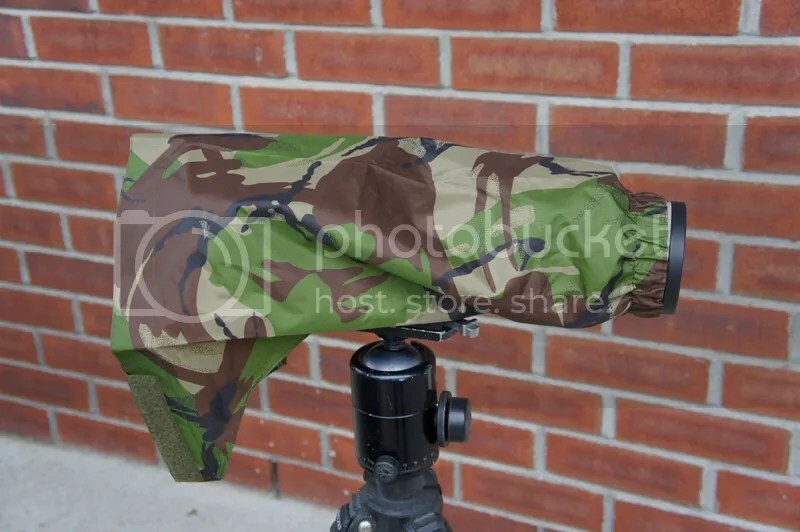 So i looked on the Net to find a Raincover that would fit my new kit, i finally found a rain cover sold by Rainydays2008 for 20$ (Canadian) for the Canon 400mm/5.6L (they sell raincovers for different lenses). At that price it was not a big risk, it’s been a good investment for protecting my gear from the rain. 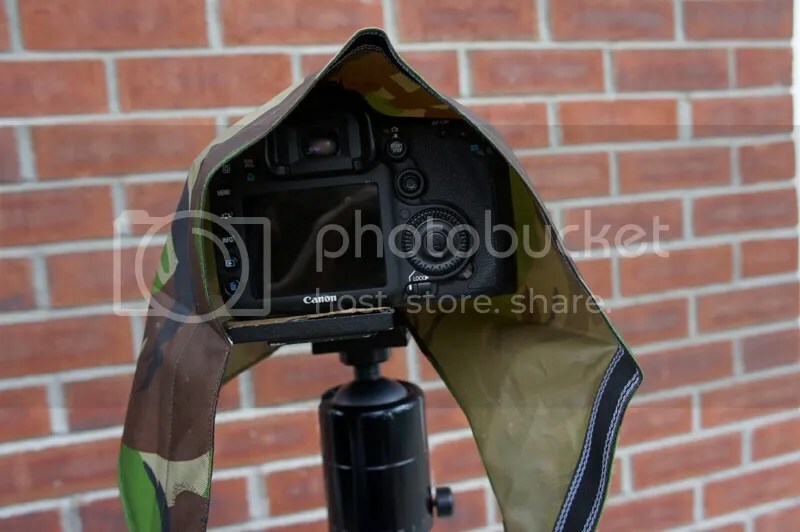 You can see in the photos above that the raincover is kept in place on the lens hood with a rubber band and it also have a small ruberized band inside to keep it from sliding on the lens hood. On the second shot above it shows that you have enough space to put your hands under it and use your gear without any problem. Even if it’s for a Canon 400mm/5.6L it would certainly work for other lenses and camera combo, the 400mm/5.6L has a 72mm filter size and i can use Extension tubes with or without my TC-1.4X II. It would certainly fit on a Canon 300mm/4L with different cameras but also for Pentax lenses like the FA*400mm/5.6, F*/FA* 300mm/4.5 or even Sigma 400mm/5.6 and 300mm/4 APO Macro. 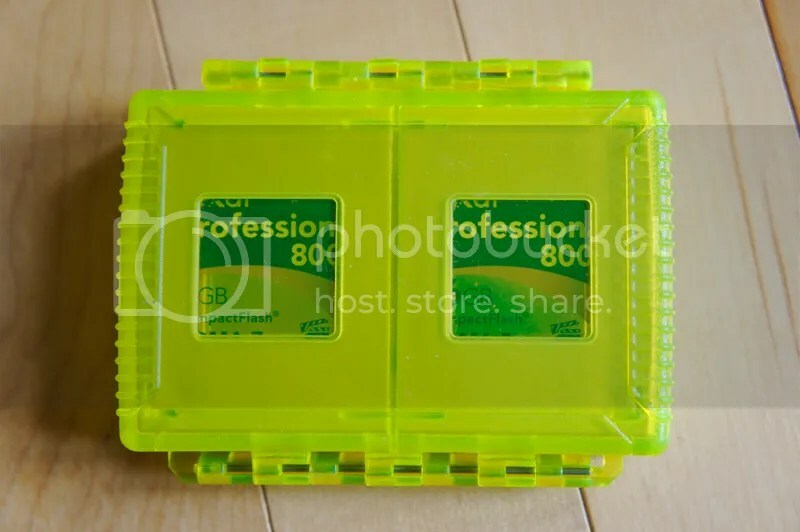 My camera bag was becoming full of SD and CF cards all piled in a pocket in Ziplock bags and it was not easy to find the one i wanted for a specific camera, so i bought a Gepe card safe Extreme case, which is waterproof and crush proof. Up to now i like it and will probably buy another one. 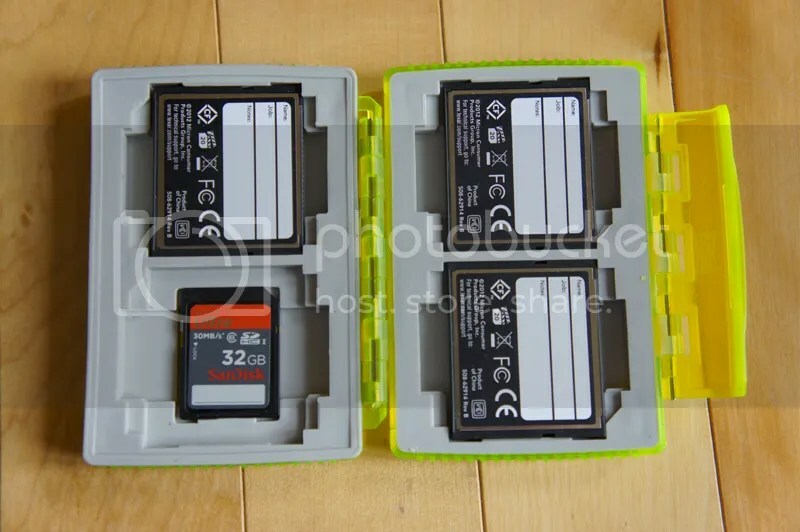 The advantage of that case is that you can put 4 SD cards and also 4 CF cards above them as seen above. Also when it’s closed you can see through so you can quickly know which cards are in the case. I tested in several occasions the Raincover and the Card case and both performed very well. Last week i was able to photograph Frogs and a Great Blue Heron for over 3 hours in the rain with periods of heavier rain fall and i had no problem at all, my camera and lens stayed dry and i kept the Card case in one of my rain suit pocket. Here are some shots i took during that morning. Canon 7D with 400mm/5.6L with TC 1.4X II and an Ext. tube, tripod, remote release. 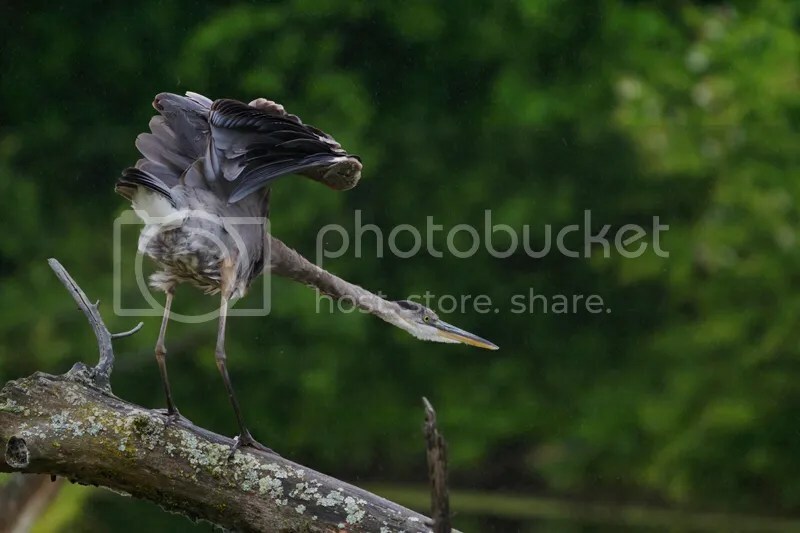 Great Blue Heron stretching, i stayed with him for over 2 hours sitting at the edge of the pond, patience even in bad weather is sometimes rewarded !